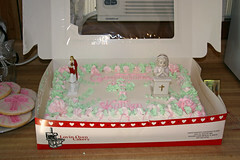 Jesus is standing on about 1" of frosting here. I didn’t think this was really funny until Kelsi commented on it. Her comment? That made it worth blogging. This entry was posted in Flickr Picks, Posts From Kelsi and tagged flickr, funny, kelsi, Photos by Ron Bieber. Bookmark the permalink. For some reason this reminds me of “Mmmm… Forbidden Donut.” Treehouse Of Horror IV, The Simpsons. Yes, that’s where I went to grade school. No, we didn’t “hang” with Jesus back then. Can’t believe there is a place like that. What a photo opp! I’ve had responding to this on my list for awhile now. I can bring tours to the Jesus spot if needed.